‘THE dream is alive’ was a slogan that encapsulated Two Mile House’s run to All-Ireland Junior glory in 2013. After scoring 2-2 in Croke Park in the All-Ireland final win over Fuerty of Roscommon, Adam Burke told the Kildare Nationalist about how his father woke him with those words on the morning of the game. The dream was to run out at Croke Park in his club colours, alongside team mates, including his brothers and childhood friends, and lift an All-Ireland title. The interview was played out the later that evening on local radio station KFM and ‘the dream is alive’ came to be something everybody in the village of Two Mile House could relate to as they celebrated the momentous win. Now, ‘the dream is alive’ is a slogan on the lips of everybody in the village once again but these days Adam Burke’s dreams are lot more straight forward than winning an All-Ireland final at Croke Park. 20 July 2016 started off as just a normal day in the life of GAA mad Adam Burke. As he had done for a lot of his life, he stripped off and took his place on the field for the Two Mile House team as they got ready to play a league game on their home pitch. It was a game that Adam never finished though and it was a day that changed his life forever. Nobody thought anything of an innocuous challenge to Adam on the pitch, even at 20 years of age he was known as somebody of great strength and all his team mates had seen Adam brush off much tougher tackles. The effect wasn’t immediate but once Adam did slump to the ground, those around him knew that this was more than a run of the mill football injury. Brother Christopher was on the pitch at the time. “When any of the lads go down and don’t get up you’d be worried, I went over and there was a group around him and then I saw it was Adam. He was in a pretty bad way, he wasn’t reacting too well. We called the ambulance, it felt like hours or days waiting for that ambulance,” he said. It turned out that Adam had suffered a devastating stroke on the pitch and in instant, all that knew him, especially his father and mother, Willie and Catherine, and brothers and sisters, Michael, Christopher, Willie, Claire, Kate and Anna, were thrown into a nightmare scenario. Once he was taken to the Intensive Care Unit in Beaumont Hospital he was put into an induced coma and the family were told that there just a 20% chance that Adam would survive. Given such a slim chance, his family feared the worst. “I remember we were sitting in a little room, maybe four metres by four metres and there were about 18 of us in there,” said his brother Willie. “We were waiting there for about two weeks and very few of us ever left to eat or sleep or anything. From there, thinking we were going to lose him, I remember Mam and everybody saying we just wanted to keep him and saying to the doctors that we didn’t care how he came back home as long as he was alive, that we’d look after him no matter what,” he said. After two weeks Adam woke up but doctors were still unsure as to what sort of recovery he would be able to make. He woke up full of tubes, paralysed down the right hand side, breathing through oxygen support and not able to speak. The doctors listed off the things that Adam might not be able to do again. Might not walk, might not talk, might not recognise family and friends but what they failed to take into account was Adam’s fighting spirit. This was a player who his brother Michael used to get wound for football matches by telling him that he wouldn’t be able to compete with the man who was marking him. Those simple little words from Michael were always enough to bring the best out of Adam. Tell Adam Burke that he can’t do something and generally, he’ll bloody well go and do it. And so he set about the long and painstaking process of recovery, amazing doctors along the way. 14 months on from the accident, he still has a long way to go, his speech is still slurred, his right arm paralysed and his right leg badly affected but he is on the right road. “From day one of the accident to today when lads ask me how he is I find myself saying that we are just delighted to have him, that just comes to me,” said his brother Willie. “When we were in ICU in Beaumont shortly after the accident we were being told that it’s really touch and go, maybe 20% chance of survival, a really low percent of ever getting out of that ICU again. From there, that’s where this fighting mentality comes into it, Adam started doing things that the doctors were telling us that he wasn’t going to do again. They told us he’s not going to walk again, he’s not going to talk again, he might not know who you are. Then the first day he woke up out of the coma he had this big smile on his face and threw his arm around you. We’ve had good days, bad days, but since then he’s just been kicking on. When somebody tells him he can’t do something he just wants to do it and that becomes his goal then. His goal now is to get back to 100%. We keep talking about percentages, we started with a 20% chance of keeping him, we are heading for that 100% now,” added Willie. “He has fierce toughness in him. There’s tough days but we have him and that’s the main thing. We’re not finished and he knows himself that he has to keep fighting,” said Michael. On his road to recovery, it’s the little small things that have felt like big victories. “We are very optimistic about him because he keeps proving everybody wrong. Even recently, he was in Beaumont Hospital and the consultants are absolutely amazed by him, they can’t believe the progress he has made. He was in a wheelchair for a couple of weeks and we used to bring him outside for a bit of air and go to the shop and that. My memory of a fantastic day was the first time that he was able to walk out, it was unbelievable, we clapped him out. It was amazing to see him walk outside like that, such a simple thing that we take for granted but it was just brilliant to see that,” said Christopher. “We have a Whatsapp group and we updated that with every little thing right from the start, we still have that. We have all the good days and bad days there, what we were told by each consultant. All the various improvements that Adam made along the way. I was looking back at it there a while ago and there was message saying ‘Adam moved his hand today’ in big capital letters and exclamation marks after it and then there was like 20 messages in response to it. That was the level we were at at the time. You kind of forget the details but then you look back on things like that,” said Willie. As a tightly knit community, the village of Two Mile House were left stunned after the accident. That something like that could happen to such a fit and strong man on the GAA field, the very thing that brought the village together following the All-Ireland win, made it even worse. Team mate Niall Browne remembers it as truly horrible time. The Two Mile House team were due to play Championship games a few weeks after the accident and many players were unsure about playing but the family were insistent that they should. “I’m very conscious when I talk about it, I’m not a Burke and not related to Adam,” said Browne. “I don’t know if the Burkes know this but it massively effected lads. I know Adam and Mick and the lads all my life, I probably see as much as them as I do my own brothers. I remember we organised a mass two or three days after. I remember a few of the lads came down to my house for a cup of tea and there were a lot of lads crying there. It’s definitely the hardest thing I’ve seen in my life. It was frightening because he was so strong, so fit, so healthy, powerful and confident. It’s almost like a shock that Burkes feel the tremor the most and then it reverberates out. 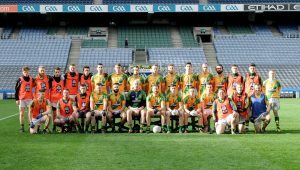 We were probably the next to feel it but I was getting calls from people from all over the country, I think anybody involved in the GAA felt it because it is a family in a way and there is a connection. There’s guys that got in touch with me, sworn enemies almost, and that was immediately all forgotten. I’d never once compare what we went through compared to what the Burkes went through…but it was definitely the worst thing I came across. “That was the most difficult time I’ve had in football. There’s a guilt, do you go up to the pitch to play, or not? Do you train, or not? What are you supposed to do? Are you disrespecting him by playing? The Burkes were very encouraging and that’s the mark of the family, they told us to go out and do our best and to represent Adam,” said Browne. The team represented Adam in great style and won their way through to the 2016 Intermediate final against Round Towers. Less than four months after his accident, Adam defied the wishes of those around him and sat in the dugout for the game. “It was hard for my mother and father to see him out there and everybody was worried but he loved it and wanted to be out there so badly, and not just in the crowd but down at the side of the pitch. That’s just more of his stubbornness,” laughed Michael. In order to help Adam’s recovery, the family are running a series of fundraiser events around Two Mile House on 30 September. There’s 5km/10km run around the village during the day and that evening, through Maureen’s work connections, they were able to plan a star studded GAA review of the year, hosted by Marty Morrissey and featuring a panel of Joe Brolly, Tomás Ó Se, Davy Fitzgerald and Michael Duignan. The family have been left stunned by the reaction of people around them since the accident and as much as this is sad story about Adam’s condition, it’s also a story of how the GAA rallies around one of its own in a time of crisis. Those people mentioned gave freely of their time without a moment’s hesitation. Then there was 12 year old Joe Smith who donated all his birthday money to Adam, and there are other stories of people going out of their way to help. Dublin midfielder Brian Fenton, a physio in Beaumont at the time, called in to Adam to spend over an hour with him the day after he had won the All-Ireland last year. He brought the Sam Maguire trophy with him and gave Adam the jersey he wore in the final. 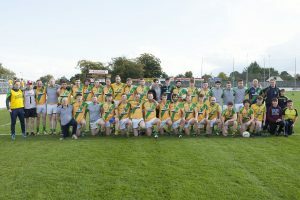 Those in Two Mile House could hardly believe it when donations came in from Fuerty, the team Two Mile House defeated in the All-Ireland final, and when their chairman got in touch to say they have organised a bus to travel from Roscommon because some of their members want to take part in the run. “There’s been an incredible response,” said Willie. For the past few weeks, over 150 people have gathered three times a week at the GAA club to train for the run. “We’ll have the fittest village in Ireland,” quipped Browne. While Adam is still smiling and retains his sense of humour, and the events of the day promise to be great fun, there is a very serious side to the fundraisers as well. “As a young man (now 21) he has this window of opportunity now,” said Christopher. “It’s been 14 months now since the accident. With a stroke there is a three year window where you must make the progress because after that your progress slows down by 20 times. That’s why there is a massive push on now to get Adam everything he needs to make these gains while he is so young and that window is still there,” he said. While the response has been brilliant and people have been in touch from all over the country, his family and friends are urging people to come out on the day. “It is just very important that people do come out and support. It’s all well and good people knowing him and knowing his story but it’s very important that everybody comes out on the day. It’s going to be great fun by the sounds of it. You don’t have to run it, I’ll be walking it,” said friend and team mate Tadhg O’Neill. The money raised will give Adam a chance of a full recovery. “He has his own goals but speech and language therapy is definitely number one. It’s not easy either, you can’t just do it all in one go, you have to do blocks of therapy. “Same with physiotherapy and occupational therapy as well. He’s walking and running but he has huge improvements to make in his leg, his whole right side, his arm and his core as well, to get all that back and get some movement back into it. “We said we’d try everything, he has this window and he has to make the gains during that. His attitude is right, we just have to be able to provide the opportunities for him,” said Willie. Adam’s dream is still alive, he just needs your help to make it a reality. ***You can read more about Adam’s story and make donations at www.runforadamburke.org. 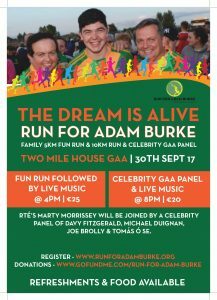 There is also a Facebook page, www.facebook.com/runforadamburke, and Twitter page @runforadamburke.